Richard's Condo... Just 1 Block from Waikiki Beach! This Non-Smoking, two bedroom, central air conditioned condo is located just one and a half blocks from Waikiki Beach. 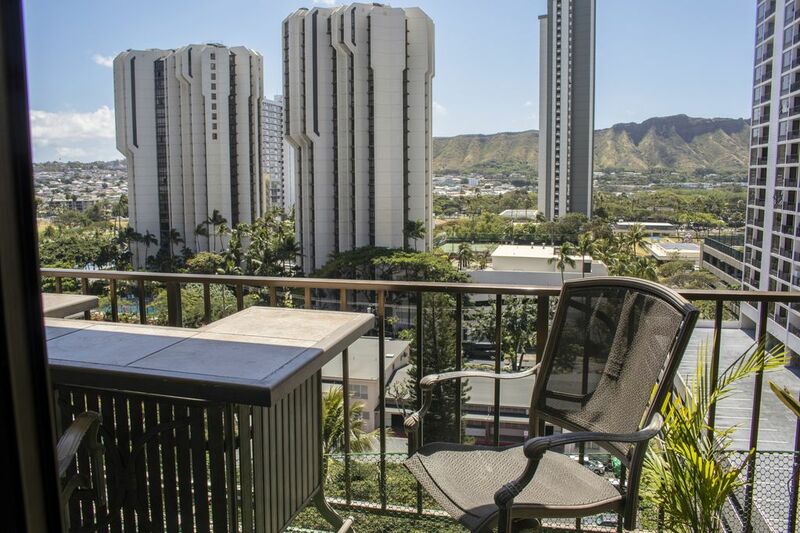 It is an 11th floor corner unit with a beautiful view of Diamond Head. Beautifully furnished with all amenities. Privately owned and has a comfortable lived-in feel to it -- you will feel right at home. A free parking space is provided. Bus line 1/2 block away and many restaurants within a 5-minute walk. Keywords: Condominium A queen size bed in each bedroom and a sofa bed in living room. Parking space is provided FREE with rental. What a great location in Waikiki!! Very comfortable setting with the view of Diamond Head. Parking is a plus. We will be back!! This condo was close to everything (especially Waikiki beach). It had all the amenities needed for a "home-base" for the family. We typically ate breakfast and prepared lunches then went out for dinner. Richard was very accommodating and even sat down and got to know us a little better when we arrived. The beds were comfortable and the view was amazing. If we ever go back to Oahu, we will definitely go back to Richard's place. Our family enjoyed it very much. Thank you Richard and mahalo. No complaints about Richard’s condo. It’s a short walk to Waikiki beach and had a beautiful view. I loved the convenience of having parking included and being able to do laundry. A great stay! Enjoyed every single day. Two mature aged couples have been happy to stay here. All that we needed. Happy to have found this place. Richard has been a friendly and well mannered host. First off, Richard was awesome! From start to finish, he was incredibly helpful. He even made us banana bread and presented my mother with a beautiful lei upon arrival. The condo was very convenient to local restaurants and shops. The bus stop was a block away and we also took Uber when we needed a direct trip. We sat out on the lanai every morning and evening and enjoyed the ocean breezes. The beautiful Waikkki beach was 2 blocks away and my husband took a short bus trip to the bottom of Diamond Head for a couple hour hike. It was a fantastic vacation! Thanks again Richard for being such a wonderful host! A great place and a wonderful host! The place looks even better than the pictures. Richard greeted us when we arrived. His place has everything a family needs on a vacation. Full Kitchen, in unit washer/dryer, two bedrooms and two full bath, pool, a reserved parking spot, convenient location to Waikiki beach, Zoo and many awesome places. During the last part of our stay we got stranded in a hurricane. We have a hard time imagining a better place to stay during such an event. Richard goes out of his way to welcome, assist, and say goodbye. He also allows guests to leave items such as spices, bottles of water, or sunblock so that subsequent guests may use them. In addition he provided a number of items such as a small cooler, snorkeling equipment, sand toys, beach towels and more. The abode is well appointed with much decoration and furniture most of which is in earthy tones. We will definitely look to stay here next time we visit Honolulu.